Set Up: 30x20 wide grid with 2 goals. 2 teams of equal number with neutrals if needed. Balls at top with coach. Activity: Coach has the balls at the top of the grid and plays into designated Attacking team. 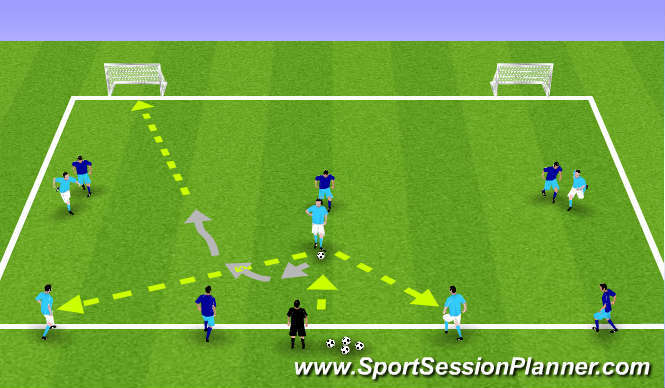 Attackers look to receive with back to goal and shield the ball.Players can either turn and go to goal, or they can play drop pass to a "Wall Player" at the top of the grid on their team. Possession changes if Defending team wins ball and can play either the coach or one of their wall players. Depending on ability, coach can play out or a player. Coaching Points: Quality control and proper shielding technique, use of the drop pass if not able to turn (don&apos;t force!!! ), checking the shoulder for their exits.